AGUA is one of San Antonio's most effective environmental action organization. We use law, science, and the support of volunteers and online activists to protect our city's source of drinking water, the Edwards Aquifer. You can help keep the Hill Country beautiful and our water clean. Look around, learn, and take action. The entries are in, and winners have been selected, in the Roots of Change Rainwater Harvesting Design Competition. Visit our gallery of rainwater harvesting designs to view architectural drawings of all the entries from our contest. Roots of Change Rainwater Harvesting Design Competition is intended to call attention to the need to protect America’s waters while simultaneously heightening awareness of environmental justice issues in a community context. 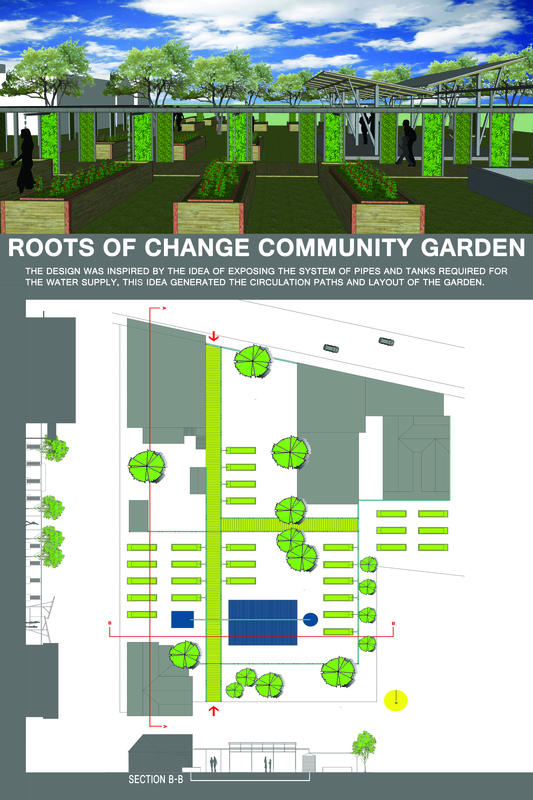 Contestants designed systems for the Roots of Change community garden east of downtown. Visit this webpage for complete details. The hidden heart of Texas - the Edwards Aquifer Ecosystem - provides the essential life source for the people and wildlife of San Antonio, Texas. Prolific, fragile, and mysterious, the Aquifer, its contributing watersheds and its Great Springs supply drinking water for more than 1.8 million people, support recreation for millions of Texans and tourists alike, and provide habitat for more than 50 species of plants and animals that live here and nowhere else on Earth. This animation shows instances where mercury was detected in samples of water taken from Edwards Aquifer test wells. The animation begins with several detections in 1971 and the detections accumulate as the time line progresses through the years, ending in 2006. Secretary of the Interior Sally Jewell presented a 2013 Partners in Conservation award to the Edwards Aquifer Recovery Implementation Program. AGUA is one of the signatories to the Memorandum of Understanding that initiated development of the EARIP. AGUA contributed throughout the development process, which began in 2006 and culminated in production of a Habitat Conservation Plan in 2012. For more about this award, read the press release. Because of an AGUA lawsuit, 4,200 acres of Bexar County endangered species habitat is permanently protected. The U.S. Fish and Wildlife Service recently announced the the land has been finally designated as critical habitat for nine rare, cave-dwelling invertebrates. This announcement reverses and expands a previous Bush-era critical habitat designation of about 1,000 acres, which left out a number of places where the species live and failed to protect sufficient area around the caves. For more information about the habitat designation, click here. Because of an AGUA lawsuit, nearly 7,000 acres of Bexar County endangered species habitat may soon be permanently protected. The U.S. Fish and Wildlife Service recently announced it is proposing to designate the land as critical habitat for nine rare, cave-dwelling invertebrates. For more information about the habitat designation, including maps, click here. AGUA has filed a motion for preliminary injunction, and requested a hearing, in its federal lawsuit over Alamo RMA's US 281/Loop 1604 highway expansion project. The toll road agency plans to construct $145 million worth of new traffic lanes, flyovers, and access ramps beginning in January. More information. AGUA has filed a federal lawsuit to protect the Edwards Aquifer and endangered species living in the Aquifer’s recharge zone. It names as defendants the Federal Highway Administration, Amadeo Saenz, Jr. (TxDoT), the US Fish & Wildlife Service and Terry Brechtel (Alamo RMA). More information. AGUA settled a lawsuit to protect 12 endangered species found only in the Edwards Aquifer and its recharge zone. The settlement with US Fish & Wildlife Service is a major victory for endangered species and the aquifer. The Edwards Aquifer Authority has directed its staff to write rules limiting impervious cover to 20% over the recharge and contributing zones. Read the press release. San Antonio's Planning Commission approved a 335-acre subdivsion in the Camp Bullis buffer zone on 7/8/2009. Read all the facts here. Which candidates will protect your drinking water? AGUA quizzed the 2009 slate of City Council candidates to find out how committed they were to protecting the aquifer. Answers to questions such as "Do developers have the right to the highest possible return on their investment?" can be found by clicking here. City Council, on October 16th, approved the acquisition of a conservation easement on 83 acres of land located in the Edwards Contributing and Recharge Zones (see map). Read more about this land, and how it was protected. AGUA, along with 3 other organizations, has filed a Notice of Intent to Sue a developer for destroying endangered Golden-cheeked warbler habitat near Camp Bullis. Read about the action here. Bexar Met Water District Hill Country reports that ethylbenzene and xylene were found in its drinking water supply in 2006. However, levels were well below the Maximum Contaminant Level set by the EPA. City Council rezoned land over the aquifer recharge zone to allow high intensity commercial development, but imposed a 50% impervious cover limit. An appeals court has overturned a ruling which upheld a developer's grandfathering claim, and sent the case back to lower court. AGUA had filed a appeals court brief against the unfounded grandfathering claim. The developer was claiming to be exempt from drainage regulations, the tree ordinance, and all other development rules adopted in the last 25 years. How the State of Texas Converted the Edwards Aquifer into a Multi-Million Dollar Commodity. An eye-opening report on the millions that private Edwards permit holders have spent lobbying the legislature. Read the report. Water marketer wanted to sell water to Kyle and a utility district. In an 8-3 vote, City Council gave a time extension and Edwards Aquifer water to developers of the PGA golf resort over the Edwards Aquifer.